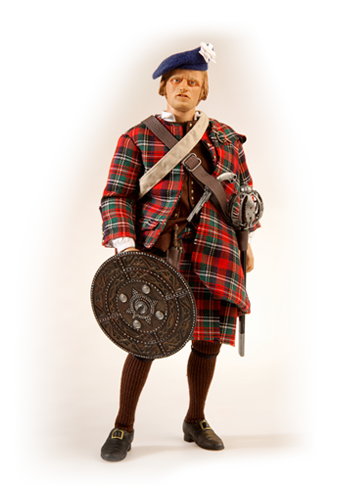 1745 JACOBITE REBELLION LIMITED EDITION 1:6 FIGURES - LOW STOCK. Now available for 2019 at only £135.00 for each figure* - INCREDIBLE VALUE FOR THESE HANDMADE WORKS OF ART! *UK Mainland deliveries. Additional charges apply for other delivery locations. Greystones 1745 REMEMBER t shirts. Limited stock, see details on our 'About Greystones' page. To celebrate the Diana Gabaldon inspired 'Outlander' TV Series on Amazon Prime in the UK, Historic Environment Scotland had our Jacobite Highlander available at Doune Castle and Stirling Castle shops. Sadly in 2018, they decided to end their association with Greystones 1:6 1745 figures. After initial great sales success to visiting customers from across the world, we are somewhat bewildered by this decision and continue to hope that they will reconsider. The Scottish Regimental Store at 9 Jeffrey Street Edinburgh EH1 1DR Tel: 0131 557 0249 has both Greystones Collectibles 1745 military figures on display and in stock. They also have a superb range of military items primarily but by no means exclusively for our illustrious serving, reserve and veteran soldiers. We highly recommend a visit. With the new TV series of OUTLANDER by Diana Gabaldon now showing in the UK, there's never been a more interesting time to remember The '45. Purchase in Glasgow at Treasure Bunker. The only retail outlet in West Central Scotland where you can see our figures on display. VISITORS TO CULLODEN & GLENFINNAN MONUMENT - sadly, for the time being, The National Trust for Scotland has decided to remove Greystones 1745 figures from their visitor shops at Culloden and Glenfinnan. It seems unthinkable that the world's only 1:6 scale figures of 'The '45' should not merit a small display cabinet place in commemoration of the brave men who fought and died during this last British mainland conflict. However, we at Greystones have not given up hope and continue to fight for a chance to have them re-stocked by NTS and once again enable those who visit Culloden and Glenfinnan to both see and choose to own our figures of The '45. • Uniforms with amazing detail and even real pockets! Our Greystones 1/6 scale figures are not toys. They are original works of art, designed to create an authentic look and feel of a typical soldier in important periods of British military history. Each 1745 Rebellion figure also comes with an historical map, complete with real red wax seal. Worldwide delivery is available at cost or, if you are in the UK, arrange your own collection from our office. Order a Greystones limited edition 1/6 military figure now to discover more about one of the world’s most famous rebellions - 'The 45'! We also have a small number of Crazy Owners figures again - Jesse James American Outlaw. While these are not an official Greystones design, they are priced competitively and offer high quality at an affordable price. Own your very own piece of the 'Wild West'. 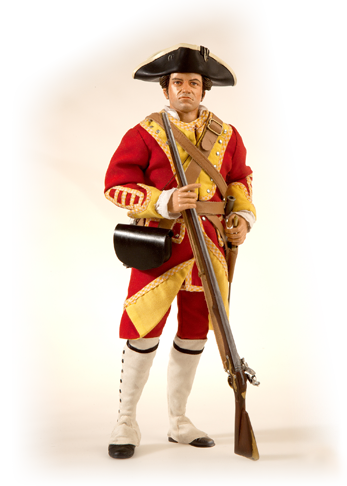 We also provide a service for bespoke 1/6th Scale Military Figures; creating one-off pieces for private collectors, museums, schools and visitor centres. We'd love to discuss a one-off figure especially for you. Come and talk to us.